What Malik is really thinking: "I can't wait until I lead my own cult - my cult won't have any stupid flowers." Never drink the worm at the bottom of the bottle. It gives you nightmares about being a hippie. Hehe!! Here you go! Welcome to Hell! My name is Marik, what's yours? 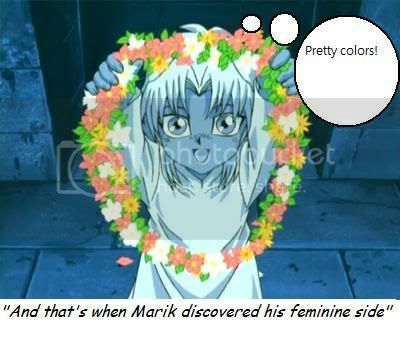 Caption1: Marik as a binky-boy. Caption2: Marik: Here mommy! This is your going away present, because soon you will be playing card games in hell! "Gah! Hawaii is using child labor to make their leis. This is illegal... in America." "For the next Batman movie Chris Nolan chose Mokuba as Poison Ivy. Many people were annoyed with the decision, but hey, Heath Ledger turned out all right." "Enjoy the flower necklace, enjoy it while it KILLS YOU"
Location: why would i tell any of you? Can anyone see the evil in this little child's eyes? "I could not afford a ring of fire, so I got you a ring of flowers instead. Fear me! Fear me, I say!" Marik: Welcome to Hawaii, LittleKuriboh! If you mean the "Marik" and "Zoro" thing, I could get into a huge debate since "L" doesn't exist in Japan and thus makes translation hard, (And for Zoro it was simply for copyright issues.) but Luffy? Marik: Here ya go! Sorry I couldn't find you a car air freshener, but those are REALLY hard to find around here... Oh, well. I hope these work for ya. Marik : Welcome to the club steve! who knew flowers could be filled with doom? 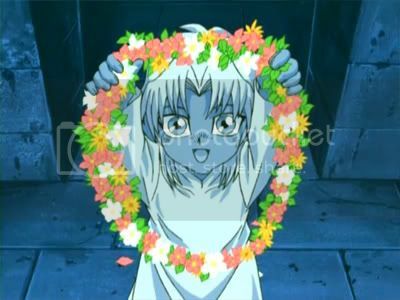 Bob: Congratulations marik, you caught the oval bouquet of flowers ! Marik: Awesome! What did i win? Bob: You get to guard this tomb for all eternity! Voice: Say, Marik? How did you find wildflowers of this kind in a dark tomb in the middle of an egyptian desert? lol XD That is great Shimmerz! "Corones para los muertos. Corones..."
This might be a little obscure to those who haven't taken an English class recently. It is a reference to A Streetcar Named Desire. Marik finds the color in Metal Gear Solid 4.